With only 20 days remaining until the launch of the Anthem of the Seas, we have decided to run through 20 fantastic, surprising and entertaining features of the ship. Here is the first instalment, an introduction to the eye-catching NorthStar Observation Pod – the first thing most of you will see when coming aboard the Anthem of the Seas. Offering incredible seascapes and views beyond the horizon, the NorthStar Observation Pod can lift you higher than any pirate ship crow’s nest. With 360 degree views at a height of 300ft above sea level – the NorthStar presents an unparalleled experience for first-time and experienced cruisers alike. 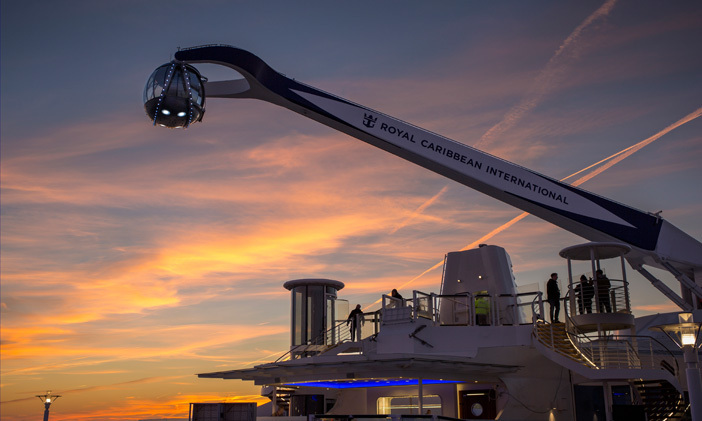 Accommodating up to 13 guests and one operator at a time, the pod is attached to a 135ft arm which lifts guests to its full height. There are no seats aboard the NorthStar, so guests have to stand at all times – although there is space available for wheelchair-users to also ride the observation pod. The NorthStar can move in any direction allowing it to dangle guests over the side of the ship, suspended over water, whilst the ship is in motion. Due to the tight controls of port authorities, the NorthStar can only travel up and down when docked in port. The NorthStar Observation Pod is completely free for guests to enjoy, operating on a first-come, first-serve basis. The pod can be booked in advance for special events such as weddings and birthdays. 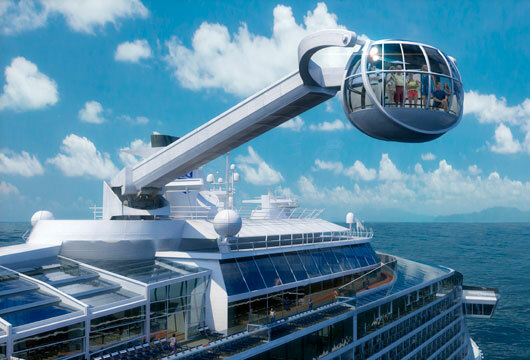 Debuting on the Quantum of the Seas, the pod can be hugely popular so the queue snakes through decks 15 and 16. The attention-grabbing nature of the NorthStar Observation Pod means it tends to attract fair-sized crowds. Royal Caribbean suggest the best times to beat the crowds to the observation pod is during port days –so if there is a destination you’d like to see but not visit, riding the NorthStar whilst in port may be the perfect solution. With only 20 days remaining until the launch of the Anthem of the Seas, we have decided to run through 20 fantastic, surprising and entertaining features of the ship.